At the next traffic light, turn left onto Tulip Drive. When the weather permits, parking for the summer concert series is available at Jimmy Long Baseball Field. The entrance to the field is located along Sycamore Drive directly across from the Parkview Community Federal Credit Union building. A number of handicap parking spaces are available in this lot. Volunteers from the McKeesport Lions Club are on hand to help direct traffic in this particular lot. Our friends at the McKeesport Regional History & Heritage Center have given the McKeesport Lions Club permission to use their parking lots for Sunday evening events at the Lions Band Shell. 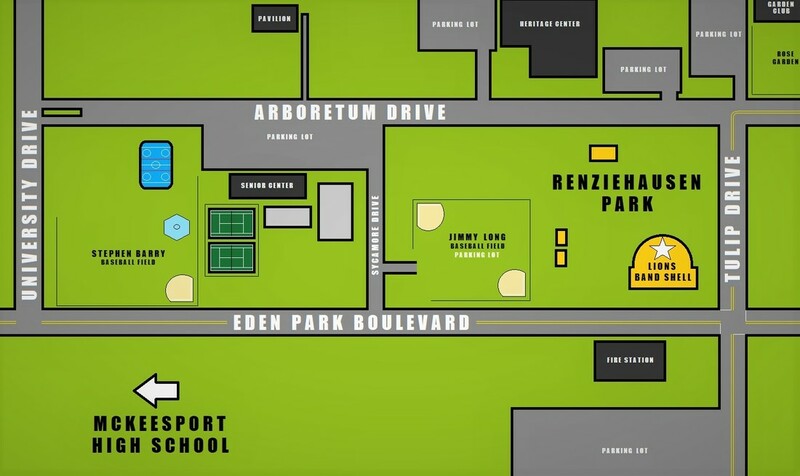 The museum is located along Arboretum Drive and features an upper parking lot and a lower parking lot. From there, it is just a short walk to the concert site. And be sure to stop back during the Center's regular hours of operation for an educational and entertaining look at local history. Additional parking spaces are available at the McKeesport Garden Club & Rose Garden which is located at the corner of Tulip Drive and Arboretum Drive. Our friends at the McKeesport Garden Club have also suggested that concert goers arrive at the show early so they can enjoy a lovely stroll through Pennsylvania's second largest rose garden. Located directly behind McKeesport Fire Station #2, the Tulip Drive Parking Lot offers enough space to safely park nearly 75 vehicles. From this level gravel parking lot, it's a easy walk to the concert site. Please exercise caution when using the crosswalk at the corner of Eden Park Boulevard and Tulip Drive. The walk to the Lions Band Shell from the Arboretum Drive Parking Lot is quite a bit longer than the rest. However, this lot has plenty of free parking and there are numerous streetlight to help brighten the way after dark.